Some words just go together. Peanut butter and jelly, ham and cheese, salt and pepper, sugar and spice. Universal pairs...cosmic twins...common markers for culture, place and language. Other pairs are uncommon, unlikely and a dang good story. Thanks to my Grandma McKay, whenever I think of the word "flannel," I also think of "pancakes." In elementary school, I checked out a book from the library about pranks. Around the same time grandma came for a visit. In what turned out to be a most fortuitous question, I asked, "Did you ever pull any pranks on grandpa?" She giggled, wheezed and wiped streams of tears from her eyes. In between gasps and shoulder shakes she told me how she'd cut out circles of white flannel the night before her planned attack. After pouring pancake batter on the hot griddle, she placed the flannel circles on top and hid them with more batter. With a straight face she served them to her even straighter-laced husband. "Nothing!" she chirruped in a near shriek. "He just kept cutting, and cutting and CUTTING!!!" At least 40 years after the fact, she was still so pleased with herself. How could she not be? Thus, that is how flannel=pancakes in my world. 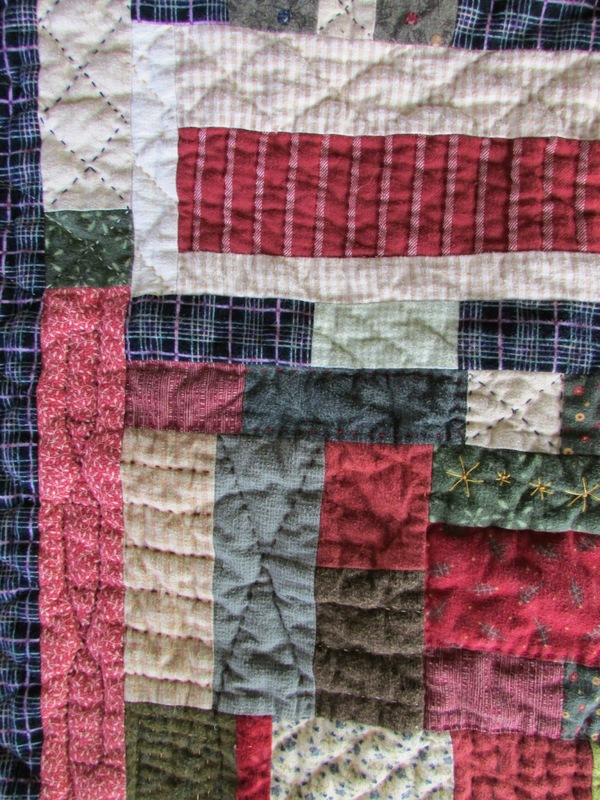 When I do improvisational piecing, I start by making a block. Once I like it, I measure the height of the block and make a lot more that are the same height. The width doesn't matter at all. 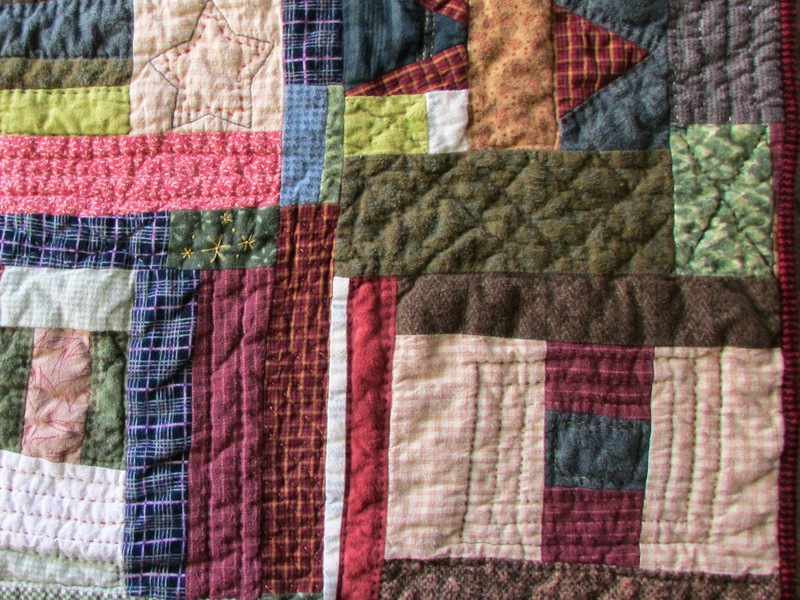 I join these blocks together and stop when I think I've made the quilt wide enough. Then, I make another block that I like, measure how tall it ended up and repeat the process. 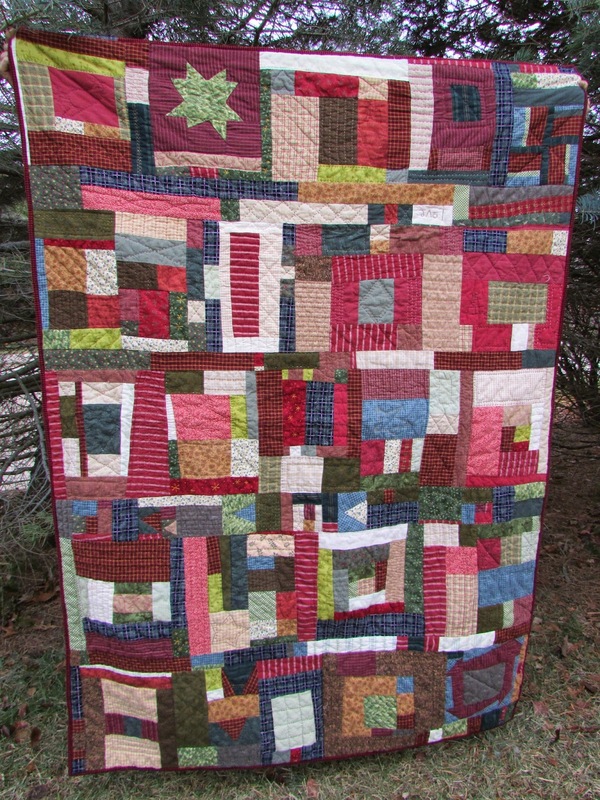 For this quilt, I also pieced together strips of fabric in shorter heights (like 4") to sew between rows. I think it helped to disguise where the blocks and rows are even more. If you're wondering, this quilt has 5 rows. Last Christmas I ordered a box of Aurifil thread that was on sale. I didn't read the description closely enough and ended up with 12 spools of 12 wt. thread. Whoops. Rather than return it, I did a little research to find out what I could use it for and discovered big stitch hand quilting. I thought this flannel quilt top would be a good project to practice on, and I was right. 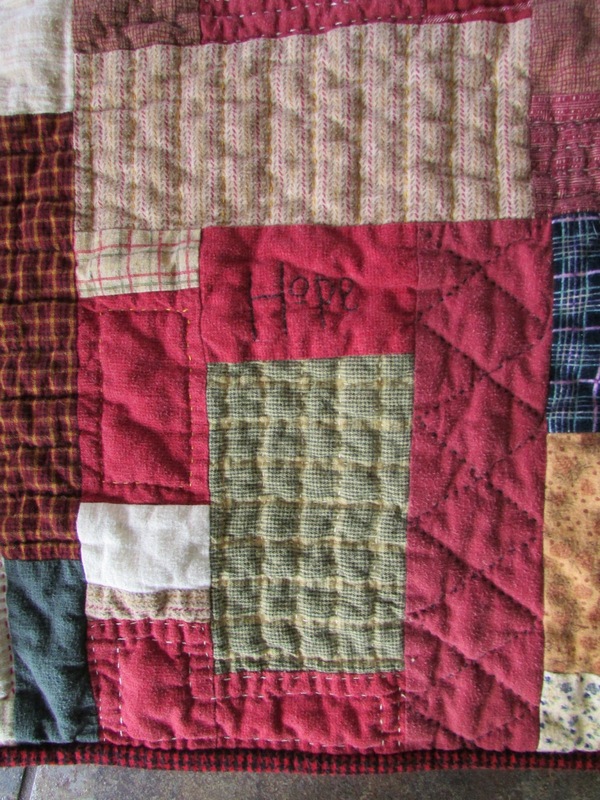 All of that improv was a very forgiving canvas for hand quilting. 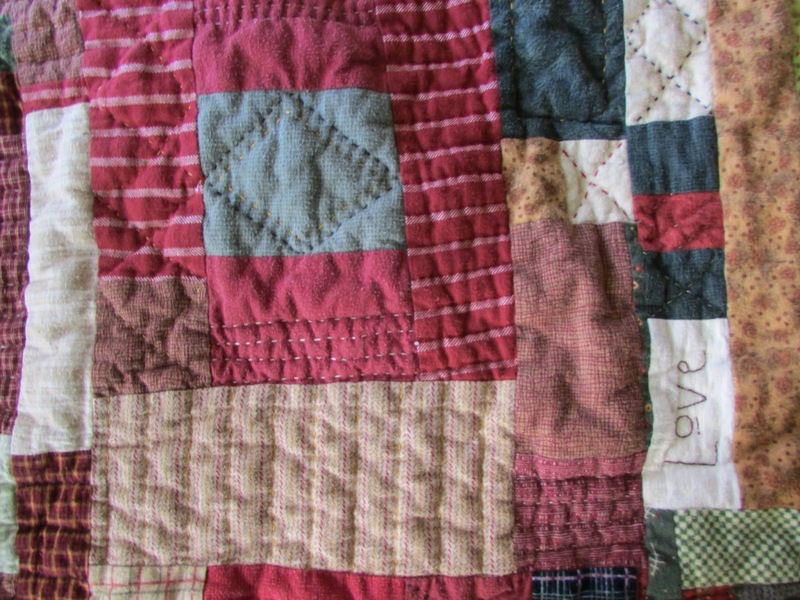 I also discovered during last year's brutal winter in the Midwest that sitting under a flannel blanket that you're quilting is one of life's great pleasures. 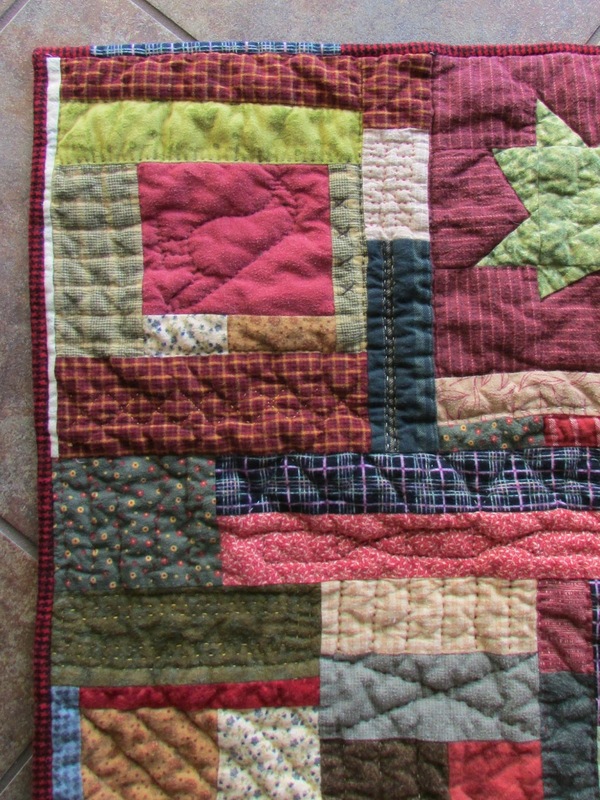 I quilted this in the same free-wheeling style that I pieced it. I didn't mark it other than sketching designs with my friXion pen that I quilted over in some spots. FriXion pens have ink that disappears completely when ironed. I found that I worked better without a hoop and without a thimble. My other grandpa once said that the only thing he could do with a pair of gloves on was pee his pants. After trying multiple thimbles and truly giving a good faith effort, I can see his point. I have two sizable callouses on the first two fingers on my right hand. I also have started on my next hand quilting project, so I guess it's all good. 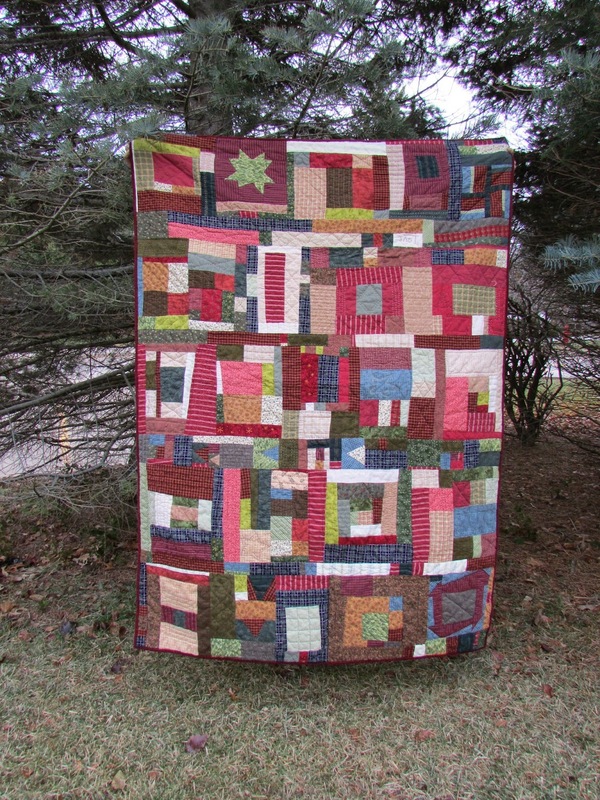 It took me 9 months of quilting to finish. I picked it up for 15 or 20 minutes at a time a couple of days a week. I can definitely tell where my first quilting attempts were. Once I was nearly finished, I looked back at the uneven, large stitches of those early days and wondered if I should unpick them and redo it. In the end, I decided that the stitches were descriptors of a journey and that I liked the added "character." And after all, it isn't just about the flannel in the pancakes, it's the way you tell the story that makes it.